Another Update… the model which replaced this one has also disappeared. The good news is that there are some amazing vibration plate trainers around – from some of the biggest and best equipment manufacturers out there. I recommend checking out the BM1507 from Body Sculpture. An impressive spec and (at the time of writing) a big discount too. Check out this dedicated amazon.co.uk product page to see the pictures / latest discount! Summary: The Bslimmer Vibration Plate is a compact model, from a trusted manufacturer (Medicarn) that comes with huge discount at amazon.co.uk (usual disclaimer here – at the time of writing!). There are a lot of positive reviews for this model, which comes in gold and even pink. You get a hand-held remote control with it – along with a workout DVD. You can see a short video of this vibration trainer in operation and read the feedback from owners on the amazon.co.uk product page. 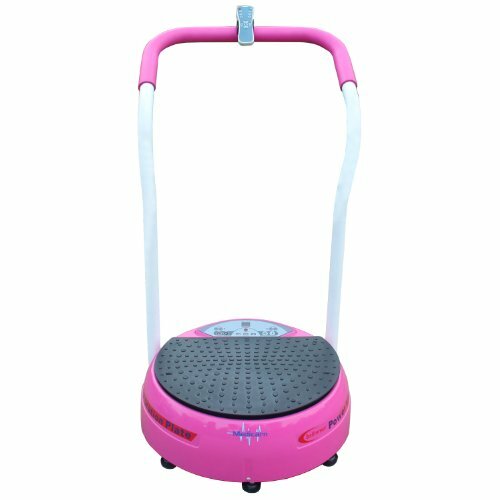 You’ll get a solid looking circular machine, which has a studded vibration plate covering most of its surface and the LED panel with controls at the front. While this is not tiny in the same way some steppers are, it is much smaller than exercise bikes or a treadmill. You’ll get handles (which are used for certain exercises) and a remote control to stop you needing to bend down or step off to adjust the program / settings. The Bslimmer vibration plate trainer has a maximum speed of 2500 RMP (more than enough! ), and 50 different levels. There is also a workout DVD, which shows you the key exercises and workouts. Some buyers have also gone for an additional wall-chart with the main exercises on it. There are 5 programs, though this vibration trainer is flexible enough to set up your own workout routines. Vibrations are oscillating more than the jerky movements of other shaker models, which has triggered some positive reviews. You’ll stand, knees bent – bracing against the movement of the plates in many different positions to exercise both core / abs and major skeletal muscle groups. The straps help you bring parts of your upper body into play. Compared with other types of home fitness equipment, feedback is very positive for this machine. It is hard to maintain more than 4 stars over 100+ reviews without a quality product. Positives include the quiet running of the machine, versatility (in terms of exercises) and the value for money. Someone specifically mentioned that they almost paid £100 more for an identical model from a different source, before finding is cheaper at amazon. Some of the negative feedback was simply people not using it – one ‘gentleman’ seemed upset that his wife was not using it, and so left 1 star! There is a combination of people who were extremely happy to have got fast results, and a smaller group who reported less than expected results. Without seeing the people, it is impossible to know – though I suspect expectations of removing layers of fat in addition to toning up muscle groups could have been incorrect. With the amazon discount available at the time of writing, this is a serious piece of kit for a bargain price. Medical and exercise science are very positive about vibration plate exercisers at the moment – and many buyers of this model are seeing quick results.